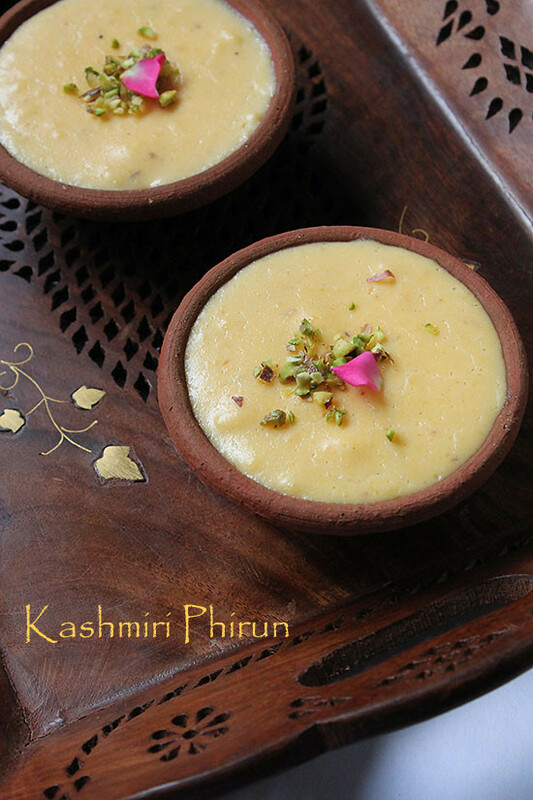 My another take on Phirni this time it’s the Kashmiri Phirun (Phirni)! There is a slight difference between phirni and phirun. 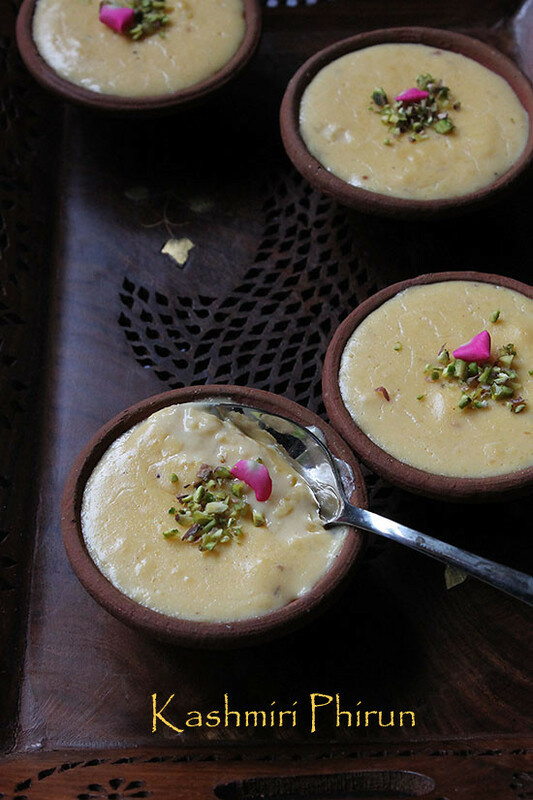 Phirni is mostly made with rice flour and phirun is made with grounded rice and saffron more like a thick kheer. Rest all the ingredients are the same. 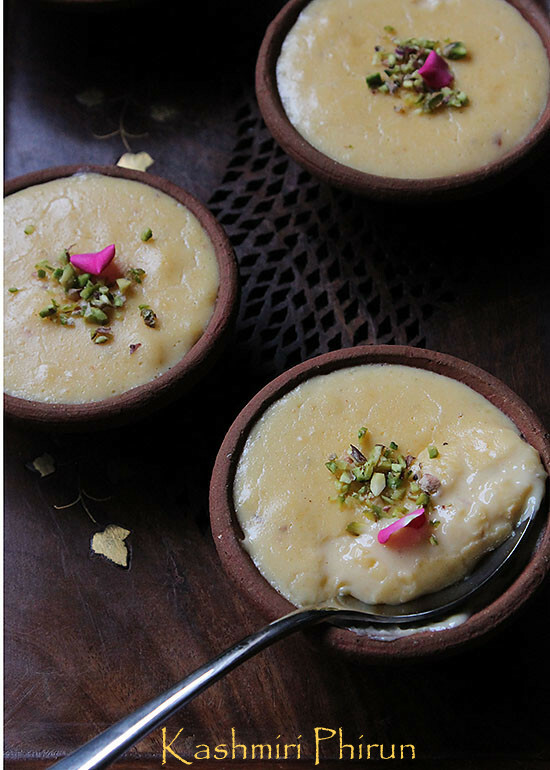 Yesterday I tried Phirni recipe and that was awesome also check Diwali recipes here. 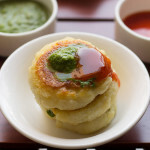 Even Kashmiri Phirun tastes equally good. 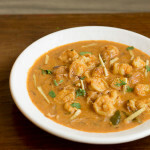 The only difference is phirun turns out more creamy and luscious with whole rice in it. I loved both version yeah simple phirni is less time consuming whereas latter takes time for rice to be soaked. My friend had given me some paper cutouts which had this recipe. 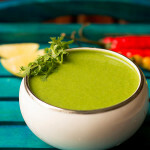 I found it quite interesting but the recipe was not so clear. So googled it to double check. However made my own version today morning. Yeah I can make desserts any time of the day it should just needs to excite me. I am kind of mad when it comes to baking, cooking and desserts. I tried papaya cake just now which was a big disaster so phirun was my savior for today. If you looking for more festive sweets then do check coconut ladoo, motichur ladoo, besan ladoo, kalalkand barfi, sweet shankarpali, phirni recipe, gulab jamun, ragi ladoo, mohanthal recipe. 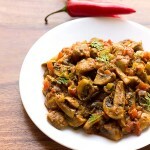 Kashmiri Phirun tastes creamy and luscious with whole rice in it. Firstly soak rice overnight in water. Strain the water. Grind the rice until it's blended. Please don't add water if it's little coarse that's okay. Boil milk in a wide bottomed sauce pan. Once it reaches it's boiling point add grounded rice. Stir all nicely. 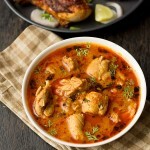 Cook on a low heat and simmer until rice cooks. The milk would start thickening. Keep stirring continuously else chances are rice may get stuck at the bottom. Mine had got stuck so switched off the gas and combined all nicely. Then I placed on gas to cook again. Take some hot milk and mix saffron. Put this into the boiling milk mixture. Time to add powdered sugar and salt. Stir all nicely for 2 to 3 mins. Now remove from heat . Pour over the clay bowls Or serving bowls. Allow them to set in the fridge. Garnish with almond, pistachio flakes and rose petals. You could also use silver leaf to decorate. Serve the phirun chilled. It will get more thicker as it cools down. 1. If using clay / mud bowls please soak some rice with water into it for 2 hrs. Later wash them and then they are ready to be used. Allow them to dry then use them. 2. 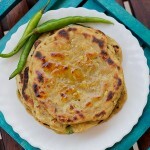 Make phirun on low heat else it might burn at the bottom. Thanks Medha 🙂 do share your views once you try them..